Jerre Wike-Picker of Grace Church paints a "protecting angel" on a sheet of canvas. 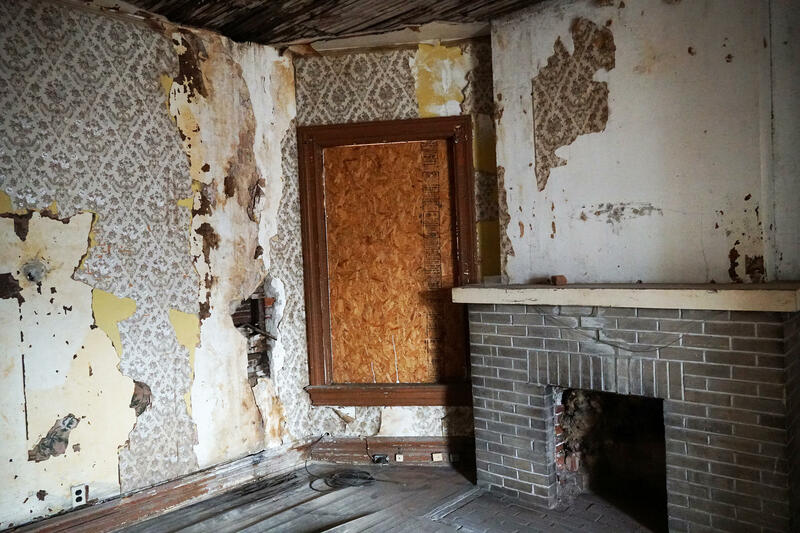 The church is partnering with nonprofit LOVEtheLOU to restore a vacant home in the city's Vandeventer neighborhood. Jerre Wike-Picker outlines an angel on a length of canvas tacked to a crumbling plaster wall. The house is in dire need of repair, but someday soon a new family will call it home. “I want them to feel the love of the community,” Wike-Picker said, dipping her brush into a jar of dark-blue paint. She’s a member of Grace Church, a non-denominational Christian congregation in Maryland Heights. The church has paired up with St. Louis-based nonprofit LOVEtheLOU to renovate the vacant home in north St. Louis and donate it to a family in need. Grace Church purchased the home at a discount from a private seller based in Nashville and later donated it to LOVEtheLOU. The goal, said Rouggly, is to support longtime neighborhood residents and help them build equity. The house, which was built in the late 1800s, will need substantial repairs, including a new roof, plumbing and electrical system. Volunteers from Grace Church will be responsible for the renovation. LOVEtheLOU has selected a family to receive the renovated home, but Rouggly said he has not yet notified them. Volunteers from the church will be in charge of the renovations, including replacing the roof, electrical and plumbing system. Although the house has been vacant for years, said church member Christy Fry, much of the original woodwork and fixtures remain. “This had to have been a glorious house,” said Fry, pointing to the four-foot slabs of marble lining the walls of the bathroom. Before the renovation officially begins, volunteer artists like Carlie Trosclair are filling the home with art installations. Near the rear of the house, Trosclair has installed a reproduction of the original staircase. 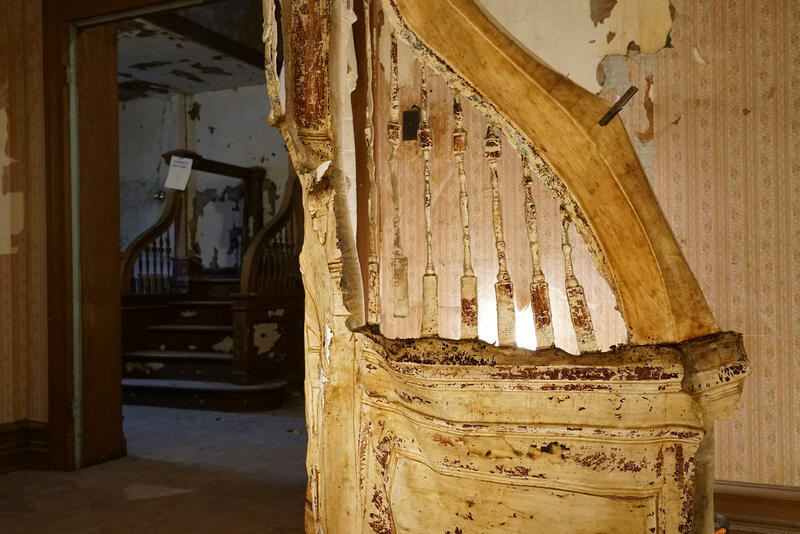 "The imprint of the staircase holds layers of memory while also acting as a visual marker of rehabilitation and restoration," said Trosclair, in an email. St. Louis artist Carlie Trosclair produced a latex reproduction of the home's staircase, shown here. In the home’s front parlor, artist Bert VanderMark unfurls large pastel banners printed with scripture verses. For VanderMark, the colorful banners are the equivalent of raising a flag from half-staff. For Eric Schwarz, a vacant building is more than a culmination of neglect and decay; it’s a treasure trove. Refab has “deconstructed” more than 100 buildings in St. Louis, a process that involves carefully dismantling a property and reselling the materials for new projects. The nonprofit recently received a first-of-its-kind contract from the St. Louis Development Corporation as part of a new push to deconstruct more buildings slated for demolition.